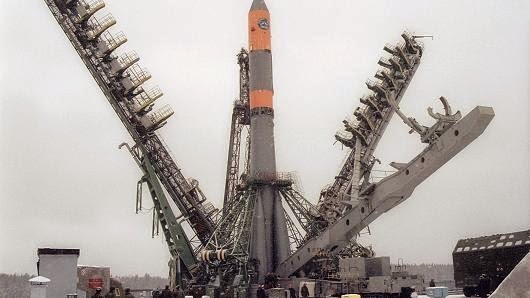 File photo of a Russian booster rocket at a launching pad of the Plesetsk Cosmodrome. Its purpose is unknown, and could be civilian: a project to hoover up space junk, for example. Or a vehicle to repair or refuel existing satellites. But interest has been piqued because Russia did not declare its launch—and by the object's peculiar, and very active, precision movements across the skies. Russia officially mothballed its anti-satellite weaponry programme—Istrebitel Sputnikov or satellite killer— after the fall of the iron curtain, though its expertise has not entirely disappeared. Indeed, military officials have publicly stated in the past that they would restart research in the event of a deterioration in relations with the US over anti-missile defence treaties. In 2010, Oleg Ostapenko, commander of Russia's space forces, and now head of its space agency, said Russia was again developing "inspection" and "strike" satellites. Moscow's ministry of defence did not immediately respond to a request for comment. "Whatever it is, [Object 2014-28E] looks experimental," said Patricia Lewis, research director at think-tank Chatham House and an expert in space security. "It could have a number of functions, some civilian and some military. One possibility is for some kind of grabber bar. Another would be kinetic pellets which shoot out at another satellite. Or possibly there could be a satellite-to-satellite cyber attack or jamming." In a week when the European Space Agency's Rosetta spacecraft landed a probe on a comet, the peregrinations of 2014-28E could seem insignificant, but they highlight an area of growing—if so far little publicised—concern for defence strategists: the weaponisation of space. Having the ability to destroy or degrade an opponent's satellite communications has been regarded as a powerful military capability since the space race began but, after the collapse of the iron curtain, many of the secret research projects Soviet and US engineers were working on were quietly shelved. In the past few years, however, interest in space weapons has revived. "It would be odd if space were to remain the one area that [militaries] don't get their hands on," says Ms Lewis. Cyber attacks on satellites are already a reality, she points out: last week, hackers linked to the Chinese government infiltrated US federal weather satellites. "The experiment was linked to the possible use of a remote capture arm and close proximity operations," said Max White, a member of the Kettering group of astronomers, which made a name for itself in the 1960s by pinpointing the location of Soviet spy satellite launches. "Both can have peaceful as well as military nuances, with the former for refuelling in space, and the latter for disabling an active payload belonging to a foreign nation, potentially without causing a debris cloud. "Whether the Russians feel they need to demonstrate such capability is a matter for debate," Mr White added. He, too, has been following the activities of object 2014-28E. n a signal of international sensitivities over the prospect of anti-satellite technologies being rapidly developed, a Chinese missile test this year drew an unusually fiery response from the Pentagon. US authorities said they had "high confidence" that a July launch was a test for a ground-based weapon to strike a satellite, accusing the Chinese of "destabilising actions". China's test was later also condemned by the EU.